Insert molding is one of the many capabilities EirMed utilizes to create exceptional, custom-engineered medical devices. With insert molding, we are able to surround non-plastic components with our plastic injection molded parts to achieve the structural integrity and performance required for each customized application. EirMed’s engineers take the time to consider the design of the insert in conjunction with the characteristics of the resin material, and the functionality of the part to produce high-performance medical devices. 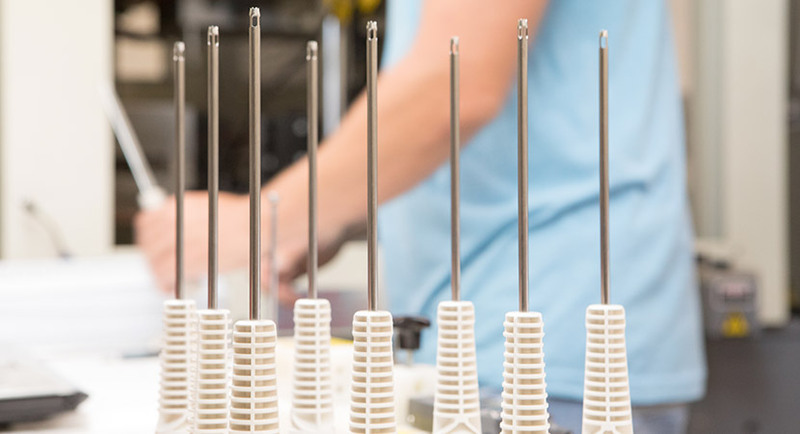 Insert molding introduces metal tubes, shafts and blades, as well as ceramics, cables, connectors, PCB boards, thixo and a variety of other materials into injections molded medical devices, allowing for the utilization of each material’s unique physical characteristics. For example, the addition of a plastic handle to a metal instrument provides an optimal ergonomic solution for clinicians when the precision of the metal instrument cannot be replicated by any other material. Through insert molding, we can achieve outstanding results by combining drastically different materials into the same device.